School is out and the kids are bouncing off the walls with an abundance of exuberant energy that is driving you insane. All you want is five minutes to yourself so you can drink that cup of tea before it goes cold again. Here are my 5 hacks guaranteed to buy a few precious minutes of peace and quiet through the summer holidays. Love it or loathe it but there is no denying the childminding benefits of CBeebies. J rarely watches anything else on TV, which is fantastic. Unlike the other kids channels on TV, CBeebies has no advertisements to distract or detract. All content is age-appropriate, so I don't have to vet any of it. And frankly, apart from the inane conundrum that is In The Night Garden, most of the programmes are entertaining and educational. Win! Give him a bottle of glue and you have given my son something to do for hours. The child will cut, craft and create to come up with some rather wonderful things. All good, as long as the gloopy glue stays safely inside its bottle for the most part! The same goes for Lego. J absolutely adores building with Lego. He is at an age where he can either follow instructions or free-build. He enjoys doing both and can sit for longish lengths of time deeply engrossed in the bricks. It could be anything. All it needs is to be called 'A Challenge'. "J, let's do a challenge. Why don't you draw me a picture of your day out?" Or, "Why not write about what you did yesterday, as a challenge?" You get the picture. And the child will immediately get stuck in with a determination that bellies his age. To be honest, I like to listen to these as well. They are so cute and so much fun. So there are times when J and I sit down together and revel in the antics of our favourite funny dog, even as I get five precious minutes to savour that hot cup of tea! Do you struggle to find a bit of 'me' time through the summer holidays? 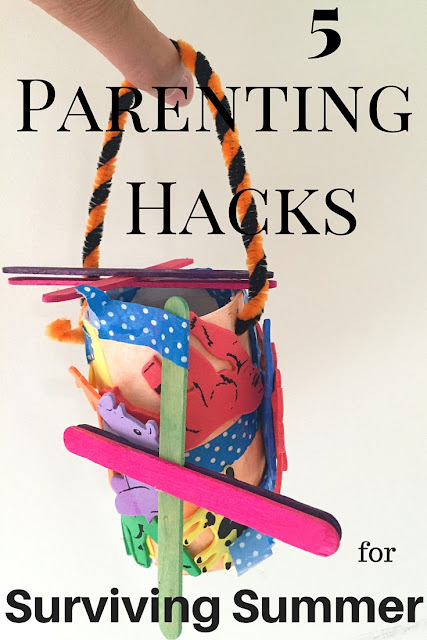 What is your favourite summer parenting hack? My friends always says that cbeebies are livesafer in summer haha. Need to show her this article.